I read in another forum that somebody got a Lando from the UK and it did not have the blaster pistol. Lando has the holster, but his didn't come with the gun. If anybody gets this, it would be interesting to know if that was just a mistake or if this Lando doesn't come with the blaster. Last edited by HothHan; 04-03-2019 at 08:43 AM. I received an email from them the other day saying they were having issues with processing my payment method, even though I've had a "pending" charge to my account for a few days now. The first person obviously didn't understand. All he did was assure me that the "pending" hold on funds would drop off soon. So I contacted them again later. The person I talked to that time said she talked to their billing department and everything was ok, nothing to worry about, and ignore the emails about payment issues. So since my order info is STILL saying there is a problem, I contacted them again this morning. 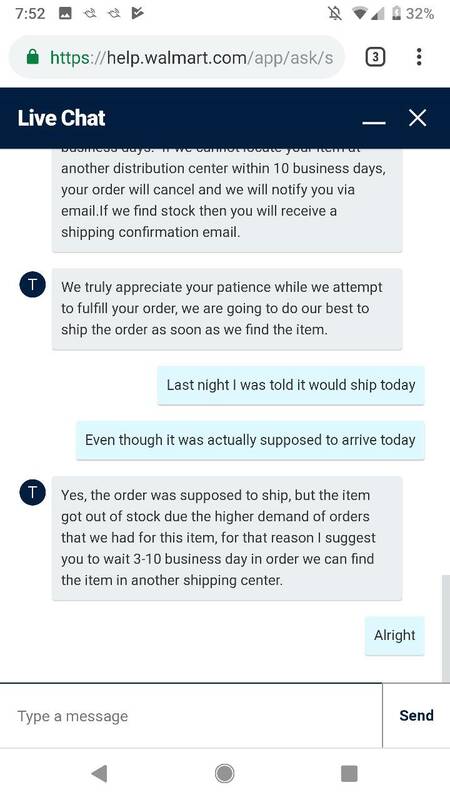 This person said that it is supposed to ship today, but that the order is showing a payment issue, and asked if I had received any emails regarding that. At this point I told him that the woman I talked to yesterday said that the billing department said everything was ok, and to ignore the emails. His response was that he saw notes made by that woman and the billing department and "hopefully" my order will ship. 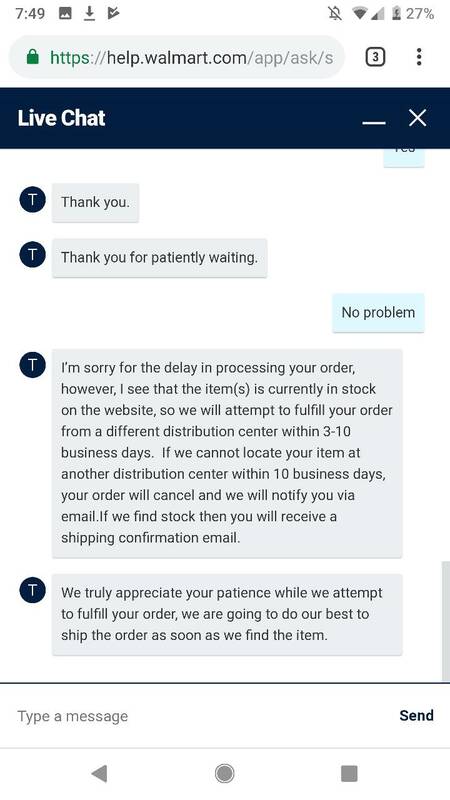 I s**t you not, all he could say was f***ing hopefully it will ship. So I guess if I don't get a shipping notification by 2pm today, I am supposed to contact them again. 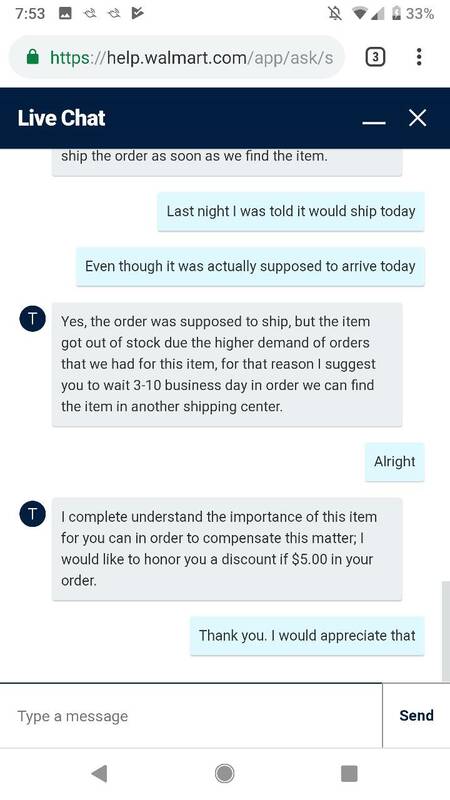 I have a feeling I will be talking to them again, and for as unpleasant as it is going to be for me to continue dealing with such hassle for something as simple as placing an order, I guarantee I'm going to make it even more unpleasant for them, if I have to contact them for a fourth time over this. I ****ing hate Walmart so bad. I don' understand why this has to be so difficult. Someone places and order, when the prodcut comes in you charge their account, then you ship the figure, and everybody gets what they want.............or am I missing something? If this was Target and I had this conversation I'd feel 80-85% confident it would work out. If it was Amazon...99-100%. My order info still says it will be available today after 6pm. LOL! It's still in "preparing order" status. This kind of stuff never happens with things like a waffle iron. I feel like it might also be some Hasbro shenanigans at play here. Maybe Walmart hasn't received their shipment from Hasbro yet. Just like the time I could have met Mr. T at the mall. The entire day, I kept saying, "l'll go a little later, I'll go a littler later..." And when I got there, they told me he just left. And when I asked the mall guy if he'll ever come back again, he said he didn't know. Well, I'm never going to let something like that happen again! Mine mine says the same thing wow just wow. They can’t seem to get their stuff together. So, it just became " in stock " again w/ eta Fri 4/5 ... as C-3PO once said, "here we go again". edit..sold out now. At the time I posted, I could only put 12 in cart but I wasn't sure if that's all they had or if that was max one could order. Last edited by R1G4R3PO; 04-03-2019 at 11:46 AM.